Sustainable Neighbourhood groups, particularly Redhead, LT Creek and Dudley, have collaborated to produce this brochure promoting responsible handling of dogs throughout our city. Relevant rules under the Companion Animals Act. Sustainable Neighbourhood volunteers will be distributing the brochures throughout the city, as well as to pet shops, vets and other relevant organisations. 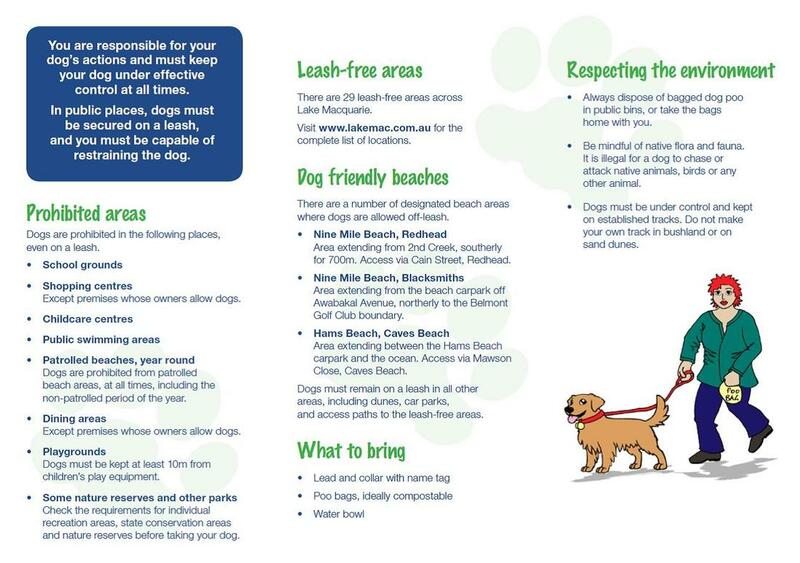 Through this brochure we are aiming to increase compliance by dog owners, improve the amenity of our public spaces, and protect our local habitat and ecosystems, by promoting a common understanding of regulation and accepted etiquette. Would you like to distribute this brochure around your neighbourhood or at a local vet or pet store? Please get in touch. The Sustainable Neighbourhood network is calling on all dog owners to be mindful of their responsibilities, and have produced a brochure to help clarify and reinforce the rules about dogs in public places. 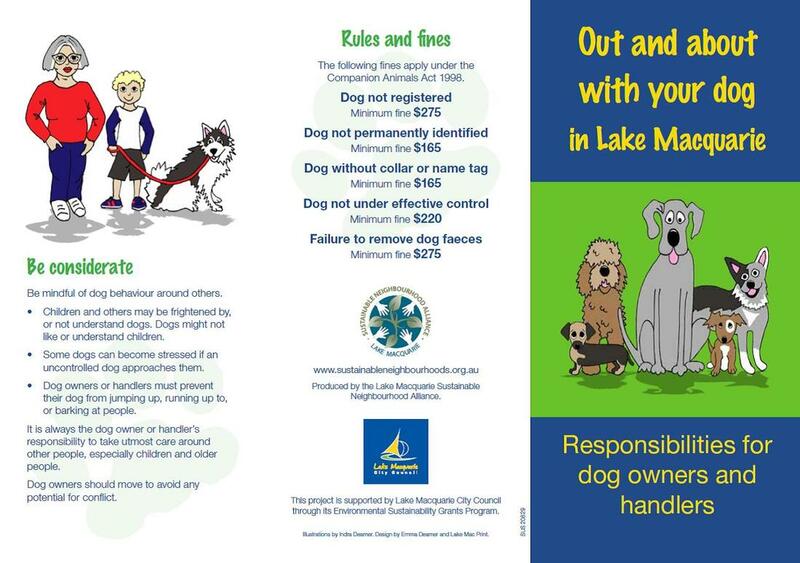 With Lake Macquarie’s registered canine population exceeding 67310, it is more important than ever that dog owners are aware of and comply with the legislation relating to companion animals. “We love dogs, and recognise the social and personal benefits that our four-legged friends bring. Most dog owners do the right thing, and we applaud those who stick to the rules.” Says Stephen Dewar of the Sustainable Neighbourhood Alliance. We have produced this new brochure to promote a common understanding of regulation and accepted etiquette regarding dogs in public places. We are aiming to increase compliance by dog owners, improve the amenity of our public spaces, and protect our local habitat and ecosystems. This project is supported by Lake Macquarie City Council through its Environmental Sustainability Grants Program.